I want to implement soft deletion, but still be able to delete permanently. Is there any way to ignore a declared @SQLDelete() annotation? You can use the @SQLDelete annotation to specify a custom SQL statement that Hibernate executes when you delete an entity. You can use that to implement a soft delete feature, which only changes the state of a record and excludes it from your query results. You can see the required mapping annotations in the following code snippet. 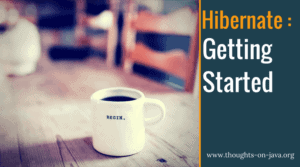 I explained the approach in more details in How to implement a soft delete with Hibernate. When you call the remove method on your EntityManager, Hibernate will execute the SQL statement defined in the @SQLDelete operation. You can’t deactivate the @SQLDelete annotation. So, if you want to remove the record from the database permanently, you can’t use the remove method of your EntityManager. You need to execute a SQL DELETE statement using a JPQL, Criteria or native query. In case you fetched the Book entity you want to remove within your current Hibernate Session, you need to call the flush and clear methods on your EntityManager before you execute the DELETE statement. This ensures that all pending changes are written to the database before you remove the record.